Known for its refreshing flavours that excite the palate, it’s easy to see why Thai cuisine has earned its spot as a crowd-favourite on an international scale. From world-class classics to unforgettable favourites, finding a spot that satisfies both your cravings and your wallets is as easy as pie. Looking for a healthier Thai alternative during your lunch break? Go for Ocha Fresh Thai situated in Telok Ayer, a convenient location for many working adults. One thing different about this place is that they use authentic spices and they even make their curry pastes and sauces in house – no MSG, no shortcuts! The Grilled Chicken & Basil and Salmon Chu Chee come with whole grain rice, so health buffs are definitely going to love these. Who wouldn’t love tasty and healthy flavours to keep you going throughout the day? Tuck into homey Thai classics with an innovative twist at this casual dining spot in Novena. In a modern setting, you can enjoy simple and tasty everyday dishes like the Mega Crab Meat Omelette, Laab Moo Tod (crispy pork belly), and Peek Gai Tod Gluea (signature mid wings). With its affordable price range, this could be your go-to spot when you crave for Thai food. A hidden gem in SAFRA Punggol, this vibrant Thai eatery serves no pork and no lard, so everyone is welcome to have a dinner date or an intimate gathering with your loved ones!. Their easy-to-use QR code system allows you to order your food with just a few button clicks away. How convenient. 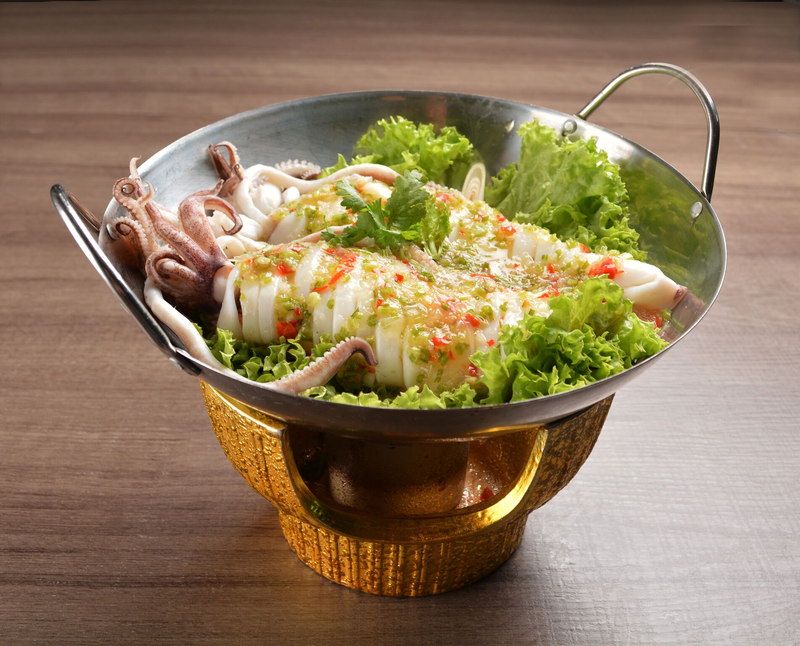 Go for the chef’s recommendations such as the Grilled Squid with Chilli Lime Sauce or Pineapple Seafood Fried Rice. With raving reviews, we know you won’t be disappointed! Ever leave a mookata eatery smelling like smoked meat? You can leave those days behind when you dine at Mookata. By introducing an innovative exhaust system at each table, diners can leave the place with a happy belly and minimal odour. There are three outlets across Singapore (Katong, Yishun, Bugis) so you can satisfy your late night cravings no matter where you are! Offering affordable and quality ingredients like pork collar and streaky bacon, Mookata has set meals that are a hit among Thai food lovers. Delightful Thai- Chinese and Thai fare await you at this comfy establishment with traditional Thai elements. Conveniently located along Purvis Street, you can order from a variety of Tom Yam Soup, Thai Green Curry, and more punchy dishes if you love that extra kick of spice. Or refresh your taste buds with a Fresh Mango Salad. They won the Bib Gourmand award at the MICHELIN Guide Singapore 2018 for their reasonable price and top-notch quality, so you know it’s definitely worth the visit. Have a taste of Thai street food at the comfort of this cosy restaurant by celebrity chef David Thompson located in Marina Bay Sands. A few of the customer-favourites are the Crunchy Prawn with Herbs and Stir Fried Chinese Broccoli with Crispy Pork Belly. That satisfying crunch will leave you wanting for more. What better way to end the meal than the Banana Roti and Durian Ice Cream? Mmm, delicious! Along Tan Quee Lan Street, you will notice there’s always a long queue during dinner time at the popular Sawadee Thai Cuisine. Serving one of the best Thai cuisines on the island, get your Thai fix here with fine plates of Thai Stuffed Chicken Wings, Grilled Kurobuta Pork Collar, and Panaeng Red Curry Roast Duck. Don’t forget to order the fragrant Sawadee Olive Fried Rice to go along with the sides. The casual dining setting is perfect for all kinds of occasions, too. Housed in a British colonial barracks in Dempsey, this charming spot is a quiet escape from the bustling city. Excite your taste buds with over 80 Thai dishes to choose from such as the Gaeng Mussaman Neau (beef curry) and Phad Graprow Gai Rue Neau (stir-fried basil chicken or beef). Pair your dishes with Thai-inspired cocktails like Siam Sunray and Thai Martini with a hint of lemongrass. There are vegetarian options too, so everyone can come visit here! If you’re craving for bold Thai food with some ‘zing’, this is the place to visit. The traditional interior and quality dishes make you feel like you’re instantly transported to the Land of Smiles. Dig into the signature sharing plate of Patara Premium starters, which includes chicken satay, grilled prawn cakes, and more. For meats, how about the Nua Yang (300 days grain-fed Australian beef tenderloin)? You will be guaranteed to leave this place with a satisfied tummy. Surrounded by lush greenery, this restaurant located atop the Labrador Nature Reserve has a gorgeous black and white interior that exudes elegance. You’ll definitely feel like a crazy rich Asian here. This place serves up a mix of traditional and modern Siamese fine-dining cuisine. Savour their Grilled Beef Tenderloin Filet with Foie Gras and Crispy Duck Breast that will definitely satisfy your Thai cravings. If you’re looking to impress someone, this is the perfect spot to go.